Welcome back to the Creatively Crafty Link Party! It’s clear from the linked up posts from last week that we are all pretty ready for spring! Because I can’t bear to pick a favorite, here are a few of the projects I really loved this week. I know I have seen yarn-wrapped Easter eggs before, but I’m not sure I’ve ever seen it done with embroidery floss. These eggs from Leaves & Stitches are lovely and a great use for little leftover bits of floss you might have after a project. You could do this with finer weight yarn, too, for a similar look. 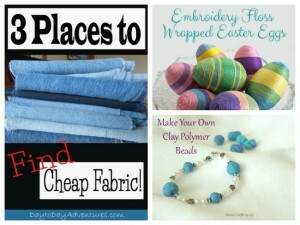 I’ve always wondered about making beads with polymer clay, and Home Crafts by Ali has a great post all about how to combine colors of clay, make holes in your beads, cure them and make a simple bracelet with the results. So cute! And while I am not in need of any more fabric or craft supplies of any sort, if you’re embarking on a large project like the rag rug Day to Day Adventures is working on, you might find yourself in need of a lot of supplies on the cheap. She’s got three ideas that could help.